Bumblebees are declining across Europe and some species have become extinct in recent decades, whilst the range occupied by others is declining. Agri-environment schemes have offered the opportunity to create the flower-rich habitats that they desperately need on farmland. There is plenty of evidence to show that areas planted with good bumblebee plants are utilised for the gathering of nectar and pollen, but until now there has been little evidence that this helps increase the size of bumblebee populations on farms providing such resources. One way to measure a population increase is to measure nest density, and this can be achieved using a molecular technique because all the workers in a nest share the same genes and are distinct from other nests. A recent study, supported by the Trust, compared total bumblebee abundance and the nest density of four common species on arable farms with and without flower-rich habitats. 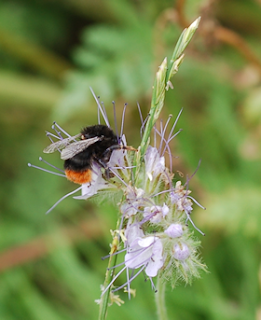 The abundance of bumblebees along transect walks was higher on farms with flower-rich habitats compared to without. The density of bumblebee nests was almost twice as high on farms with flower-rich habitats and three times greater for Bombus hortorum, also known as the garden bumblebee. The provision of flower-rich habitats did not, however, increase the overall diversity of wild bees, of which 104 species were found in total, almost half those that occur in southern England, highlighting the importance of farmland for wild bees. However, it wasn’t all good news, as the rare species were seldom found. Looking at which flowering plants were visited revealed that bees visited 124 plant species. Just over half of bumblebee nectar visits were to black knapweed, with twenty percent of pollen visits to bird’s-foot trefoil. The other popular forage plants for bumblebees were clovers, spear thistle, hedge woundwort, lesser burdock, white dead-nettle and wild teasel. For other wild bees, such as the solitary bees, black knapweed was also the most popular, but flowers with more open structures were also used such as hogweed, catsear, ox-eye daisy, scentless mayweed, smooth hawksbeard, red bartsia and fleabane. 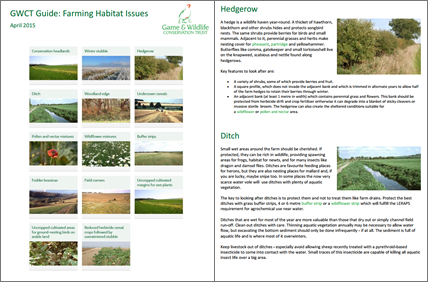 Many of these species are not included in commercial wildflower mixes, which shows the importance of protecting the hedge and woodland edge, where they naturally occur, from fertiliser and herbicide drift, which damages the plant community. To benefit the rarer bumblebees and other wild bees that typically only forage over short distances (less than 200m) it is important to provide flower-rich habitats evenly across the farm and, for mining bees, patches of bare ground for nesting.